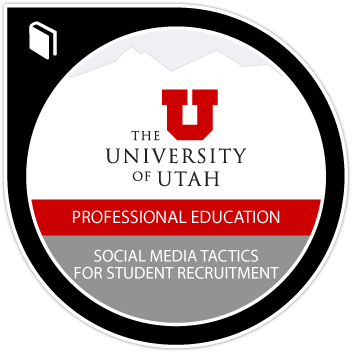 Badge earners will understand how to use social media marketing tactics to attract and retain students to academic programs.They will be able to create content to attract the right students, identify a target online audience, and build awareness. Earners will be able to effectively utilize “calls-to-action” in campaigns and build a digital community. They will be able to utilize major social media channels, set goals, measure success and align social media to department objectives. Attend one day course specifically designed to help academic program support staff learn how to effectively use social media to attract and retain students.